What a weird and horrible week it's been so far. Both on a personal and professional level, I can say things have been pretty downright awful. First, the good news (And, by "good," I mean, "less bad"). I was told by Official Re-Employment People that my industry (publishing, for those keeping score at home) has one of the highest layoff percentages in the country at the moment. What's worse, though, is the fact that publishing also has one of the lowest re-employment rates in the country, due to the fact that many houses are laying people off (or closing outright), and there are many, many fewer jobs than there are people in search of them. The bad news is something I don't want to get into. But, man, lemme tell ya...it's been a week. On the bright side, I did manage to apply to a few more jobs yesterday (making the grand total near 40 in the past three weeks), and as usual with these things, I'm very much qualified for the positions I've applied to. For now, though, I'm still scouring the usual sites, trying to find something in my industry. It's a weird thing, to have a profession, a career, and then be told by Outside Forces that you can no longer work within that field. Seriously, what the heck do you do when all the doors to your profession (a profession you're quite good at, by the way) close up and double-lock? I can say, honestly, I have no idea. So, yeah, when I say that I could use a Wednesday, I really and truly mean it. And happily, today is Wednesday. So, at least there's that. It's a weird week for comics at my LCS, mostly due to the fact that Diamond shorted my retailer pretty heavily last week. So, while there's a decent amount of stuff coming into the market today, my store will be seeing much more product than most. Yay, being broke. Still, I'll be grabbing a small handful of titles, and there are a couple that I'm actually really looking forward to. That said, it's time for the list of things to buy! First up, we have the welcomed arrival of an annual tradition. The chill is in the air, the leaves are falling, and there's an abundance of candied apples for sale at the grocery store. Also, the DCU Halloween Special ships this week, so you know it's officially That Time of Year. Yep, that's right. Today sees the release of the yearly anthology book that many stare at in the store and go, "Um...no, thanks." I love this stupid, mostly useless, (and bafflingly expensive) yearly title. Each year, DC writers, artists, and even editors (yep, sometimes they let them out of their cages!) all pitch in and contribute to the oversized (80 pages long!) Halloween special. 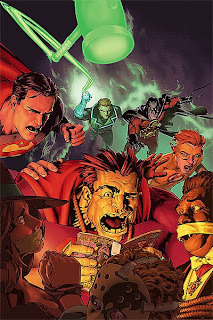 This year, expect stories by Billy Tucci, Joe Harris, and Franco, and art by Rags Morales and Joe Prado. And, while you can't expect to find anything truly creepy here (for that, check out the House of Mystery Halloween Annual, which shipped last week), you can expect some good old superhero fluff. Every year, I like to pick up whatever Halloween-centric comics look good to me, and I usually read them on the 31st while I'm answering the door and handing out candy. And, of course, while eating my yearly fill of Reese's Peanut Butter Cups. It's a fun, childish thing that I still get a kick out of. Darkness falls across the land as the DC Universe faces its greatest horror in this Halloween special filled with all-new stories! Watch as Guy Gardner continues his quest to share Halloween with the cosmos and his fellow alien Green Lantern Corps members. In another tale, Red Robin finds the true, deadly meaning of the sinister holiday while overseas on his quest to find Bruce Wayne. Meanwhile, Bizarro receives neither trick nor treat in his own backwards celebration of the spookiest night of the year on his home world. Plus, 10 other ghoulish tales to fill you with fright this Halloween! Like I said, this is good, goofy Halloween fun and if you're in the mood for something light, but still true to the season, I'd suggest giving this book a go. Speaking of Halloween reading, I also have a stack of graphic novels that I like to dive into on or as close to Halloween as I can. 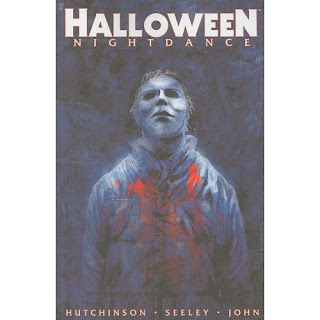 Last year, the excellent (and true to the movie continuity) Halloween: Nightdance was collected in an affordable trade paperback from Devil's Due Press. And, while the current mini-series has (apparently) stalled out at DDP, Nightdance features some of the creepiest, scariest comic book horror I've ever experienced. Horror, methinks, is the toughest genre to pull off in a comic, but Nightdance drips with eerie visuals and skin crawling circumstances. So if you're a fan of the original Halloween (and, really, who isn't? ), I definitely suggest you find this book. It's on Amazon right now, for under $13, and you can have it in time for the holiday! Finally, we have Beasts of Burden, issue two, from Dark Horse Comics. I had high hopes for issue one last month, and the book did not disappoint. This title manages to juggle a creepy story, sarcastic and spot-on dialogue, and whimsical art. How? Well, it's written by Evan Dorkin, and painted (yes, fully painted) by Jill Thompson. This series follows around an eclectic group of four-legged paranormal investigators (as if "four-legged paranormal investigators" could be anything but "eclectic") as they dig deeper into the mystery of last issue. Here's the blurb from Dark Horse. When some pups go missing, it’s up to a ragtag team of dogs and. . .a cat to get at the heart of this mystery that reveals horrors greater than they could have ever anticipated. Turns out these pups aren’t the first good-natured animals to disappear in recent weeks, and it’s going to take some strong will, determination, and straight-up heroics to unravel this peculiar case. 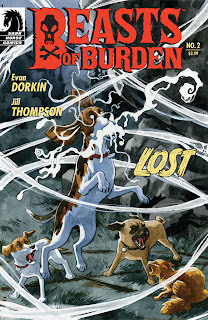 Adventure, mystery, horror, and humor thrive on every page of Beasts of Burden--a comic-book series that will capture readers’ hearts and haunt their dreams. A book that I am 100% onboard with, Beasts is yet another example of a stellar title from Dark Horse that ships on-time and doesn't take a decade of continuity knowledge to pick up, follow, and enjoy. That, and the art is beautiful and haunting and perfect. Give it a shot! Welp, that's it for today. I'll have some more Halloween Reading Suggestions in the coming weeks, starting tomorrow with a review of book I just finished and loved. So, the only thing left to do is ask...What are you Waiting for?